Such were the feelings of Americans in 1886 about the relatively small group of Indians that caused so much death and destruction across the Southwestern United States. People either despised the Apaches or did not fully consider their well-documented acts of terror and embraced the legend. Apaches once roamed an area encompassing a large section of the Southwest U.S. and a part of northern Mexico known as Apacheria. The Apaches, although agriculturalists in times of peace, were known for their aggressive behavior, raiding neighboring bands of Apaches when low on food or other supplies. When the Spanish appeared in the region some 500 years ago, they captured, killed and brutalized the Indians, causing a violent reaction among the Apaches. This hostility was later transferred to the Mexicans as well as American settlers. The Apaches expected no mercy and gave none. Geronimo, a member of the Bedonkohe band and later a leader of the chiricahuas, became the most famous Apache because of an incident which led the warrior/priest to seek a lifetime of revenge against the Mexicans. His urge to fight extended to the growing number of Americans moving into Apacheria. In the summer of 1850 a contingent of Apaches went on a trading foray into Mexico. The group, headed by Mangus Coloradas, included Geronimo and the families of the warriors. They stopped at a town called Janus and set up camp outside of town. 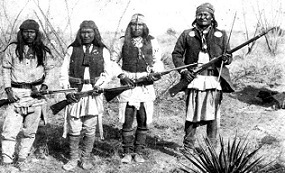 Geronimo’s ability to lead was recognized by his brothers-in-arms. He received a number of wounds over the years and survived them all. And with every bullet his confidence grew. Geronimo and his small group, the most restless and bellicose, surrendered for the final time in Skeleton Canyon, near the border with Mexico, on September 4, 1886. The prisoners, only eighteen in number, along with twenty women and children, were then shipped to Florida on a special train. Crowds gathered at every stop to see the captured Apaches, especially Geronimo. Those who were allowed to visit on the train, including reporters, eagerly sought souverneirs. Geronimo quickly became adept at modeling and selling every item he and his companions could offer. His new found love of capitalism remained with him the rest of his life. When the train reached Pensacola on October 25, 1886, the women and children were sent on to Fort Marion at St. Augustine, Florida. There they joined other Indian P.O.W.s. Geronimo and sixteen Apaches who completed the trip, began serving their time at Fort Pickens on Santa Rosa Island in Pensacola Bay. This was all made possible by some influential citizens in Pensacola (businessmen) pulling strings in Washington. The goal being to establish a tourist attraction. And they succeeded. The trip across the bay and later, living along the water’s edge, caused the Apaches to rethink some of their beliefs. They were religious and believed in many spirits. The Great Spirit, the Supreme Being, was named Essen. Its evil counterpart was called Che-din. Apaches also believed that the spirits of bad Apaches resided in animals living in water. For this reason, they refused to eat fish or even pork, since hogs ate snakes that swam in water. They were really confused when they saw porpoises cavorting for the first time and huge alligators lying on the shore. The prisoners went right to work setting up housekeeping in the casemates along the interior wall of the fort. They did their chores, such as maintenance and gardening, without hesitation or complaints. The Apache leader would greet visitors and try to find a way to extract money from his fans. He would lament, through his interpreter, George Wratten, how poor he was. Geronimo had his interpreter Wratten write letters to his wifes at St. Augustine, telling them and his children how much he wanted to be reunited with them. His wish became a reality when the U.S. Government moved the prisoners from Fort Marion in April of 1887 to a military base at Mount Vernon, Alabama. But 31 women and children of the 384 transferees were diverted to Fort Pickens to rejoin their husbands and fathers. The fort was closed to visitors while the new additions were given time to become acclimated. Then in June a “GRAND INDIAN WAR DANCE” was held and hundreds of Pensacola residents attended. The dance lasted well into the night without incident. The fact is that a “medicine dance” had been substituted since a war dance tended to drive the Apaches into a frenzy. Violence would erupt and people would be killed. During his stay at Fort Pickens, Geronimo and his men adopted American customs and dress in varying degrees. Geronimo wore pants, a shirt and a straw hat. His changes became more dramatic as he moved to other prison camps and traveled around the nation, cashing in on his status as a celebrity. It was not unusual to find him in a suit and his hair cut in a civilized way. On May 13, 1888, Geronimo and the other prisoners were moved from Fort Pickens to Mount Vernon where they lived until October 2, 1894. Then a train took the combined POWs to their next stop at Fort Sill, Oklahoma.There are some real blemishes sneaking around in Windows 8 and Windows 10. One of these issues is mistake. Numerous clients who have moved up to Windows 8 or Windows 10, have confronted this issue in the early forms regularly where the web association would just drop and get back on haphazardly.During his last years at Fort Sill, Geronimo’s fame grew as he made public appearances around the country, speaking and engaging in commerce. On February 17, 1909, Geronimo took his last ride on the ghost pony, ending a long, strange, eventful life. 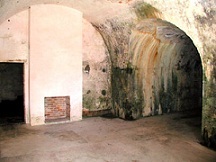 Want to visit Fort Pickens? The fort has a lot to offer vacationers and the cost is reasonable. Included are camping, fishing, bird watching, a museum, beautiful beaches, nature hikes, photography, and special events for children and adults. For info and contacts.